As measured by the global turnover, butadiene rubber (BR) is the second most important rubber after styrene-butadiene rubber (SBR), which are both synthetic rubber types. BR is formed by the polymerization of butadiene. Products made of BR offer very high resilience, good insulation properties, abrasion resistance, and remain flexible at low temperatures. According to the most recent study by Ceresana, worldwide consumption for this elastomer type amounts to about 3.44 million tonnes per year. The region Asia-Pacific accounted for over 57% of global revenues, followed at a large distance by North America and Western Europe. Ceresana expects the revenues generated with BR to increase by, on average, 4.1% per year until 2025. The dominating sales market for BR is the segment automotive tires with a share of about 73 % of total global demand. 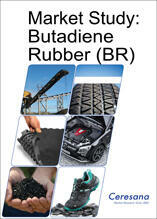 Besides SBR, natural rubber, and carbon black, BR is the most important ingredient for tire manufacture. In 2025, tire manufacture is likely to consume 2.9 million tonnes of BR. However, the end use market with the highest percentage growth, 2.2% per year on average, is the modification of engineering plastics. The mechanical properties of high impact polystyrene (HIPS) and acrylonitrile butadiene styrene (ABS) in particular can be improved by BR. Several industrial sectors, ranging from the chemical industry, engineering, construction, leisure products, and sports goods to electrics and electronics, require BR for a variety of products. In 2017, about 433,000 tonnes were utilized worldwide in this sector. Chapter 1 provides a description and analysis of the global BR market, including forecasts up to 2025: The development of revenues, demand, and production is analyzed for each region of the world. Chapter 2 offers a detailed analysis of 18 countries: Demand, export, import, output, capacities, and turnover in regard to BR. In addition, these countries are also analyzed regarding application areas. Chapter 3 analyzes the different types of application areas of BR in detail: Data and influential factors regarding the use in tires, modification (ABS, HIPS), and in other sales markets (such as construction, engineering, leisure and sports goods as well as the electrical and electronics industry). Chapter 4 offers a useful directory of the 33 most important BR producers, clearly arranged according to contact details, revenues, profit, product range, production sites, profile summary, and information on capacities. The most important manufacturers include: Arlanxeo Holding BV, Asahi Kasei, Bridgestone Corporation, Goodyear Tire and Rubber Company, JSR Corporation, LG Chem Ltd., PetroChina, and Sinopec Corp.